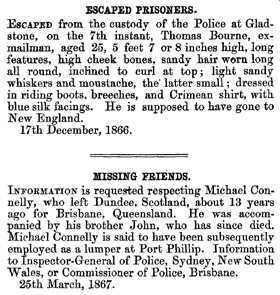 Queensland Police Gazettes are an extremely useful resource for family and local historians alike. Compiled to be distributed amongst the Police Force only, these gazettes contain details and information that can not be found anywhere else. Gazettes provide for fascinating searching and useful information for anyone interested in Queensland's history and people. list of medical practitioners with addresses and qualifications; pharmaceutical list - name, date, address and qualification; list of licences - victuallers, packet, billards, bagatelle, tobacco; list of police districts and inspectors; and 29 pages of photo supplements.